George Gardstein was born in Russia in about 1887. 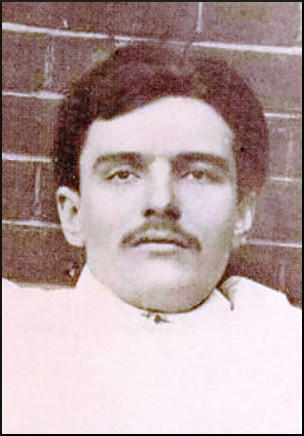 He was later described as "height 5 feet 9 inches, complexion pale, hair brown, slight dark moustache worn slightly up at ends, good physique." Gardstein took part in the 1905 Russian Revolution. Afterwards he fled to London where he shared a room with Fritz Svaars. He later began a relationship with Nina Vassilleva. In March 1910, he rented a room in 44 Gold Street. Nina asked him how he made his money but he told her to mind her own business. Gardstein also owned a Mauser gun, which he concealed in a specially constructed trouser pocket. Later that year he moved to 59 Grove Street and shared a room with Peter Piaktow (Peter the Painter). On 16th December 1910, a gang that included Gardstein, attempted to break into the rear of Henry Harris's jeweller's shop in Houndsditch, from 11 Exchange Buildings in the cul-de-sac behind. The Daily Telegraph reported: "Some two or three weeks ago this particular house in Exchange Buildings was rented and there went to live there two men and a woman. They were little known by neighbours, and kept very quiet, as if, indeed, to escape observation. They are said to have been foreigners in appearance, and the whole neighbourhood of Houndsditch containing a great number of aliens, and removal being not infrequent, the arrival of this new household created no comment. The police, however, evidently had some cause to suspect their intentions. The neighbourhood is always well patrolled. Shortly before 11.30 last night there were sounds either at the back of these newcomers' premises or at Mr Harris's shop that attracted the attention of the police." A neighbouring shopkeeper, Max Weil, heard their hammering, informed the City of London Police, and nine unarmed officers arrived at the house. Sergeant Robert Bentley knocked on the door of 11 Exchange Buildings. The door was open by Gardstein and Bentley asked him: "Have you been working or knocking about inside?" Bentley did not answer him and withdrew inside the room. Bentley gently pushed open the door, and was followed by Sergeant Bryant. Constable Arthur Strongman was waiting outside. "The door was opened by some person whom I did not see. Police Sergeant Bentley appeared to have a conversation with the person, and the door was then partly closed, shortly afterwards Bentley pushed the door open and entered." 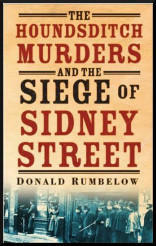 According to Donald Rumbelow, the author of The Siege of Sidney Street (1973): "Bentley stepped further into the room. As he did so the back door was flung open and a man, mistakenly identified as Gardstein, walked rapidly into the room. He was holding a pistol which he fired as he advanced with the barrel pointing towards the unarmed Bentley. As he opened fire so did the man on the stairs. The shot fired from the stairs went through the rim of Bentley's helmet, across his face and out through the shutter behind him... His first shot hit Bentley in the shoulder and the second went through his neck almost severing his spinal cord. Bentley staggered back against the half-open door and collapsed backwards over the doorstep so that he was lying half in and half out of the house." Sergeant Bryant later recalled: "Immediately I saw a man coming from the back door of the room between Bentley and the table. On 6 January I went to the City of London Mortuary and there saw a dead body and I recognised the man. I noticed he had a pistol in his hand, and at once commenced to fire towards Bentley's right shoulder. He was just in the room. The shots were fired very rapidly. I distinctly heard 3 or 4. I at once put up my hands and I felt my left hand fall and I fell out on to the footway. Immediately the man commenced to fire Bentley staggered back against the door post of the opening into the room. The appearance of the pistol struck me as being a long one. I think I should know a similar one again if I saw it. Only one barrel, and it seemed to me to be a black one. I next remember getting up and staggered along by the wall for a few yards until I recovered myself. I was going away from Cutler Street. I must have been dazed as I have a very faint recollection of what happened then." Constable Ernest Woodhams ran to help Bentley and Bryant. He was immediately shot by one of the gunman. The Mauser bullet shattered his thigh bone and he fell unconscious to the ground. Two men with guns came from inside the house. Strongman later recalled: "A man aged about 30, height 5 ft 6 or 7, pale thin face, dark curly hair and dark moustache, dress dark jacket suit, no hat, who pointed the revolver in the direction of Sergeant Tucker and myself, firing rapidly. Strongman was shot in the arm, but Sergeant Charles Tucker was shot twice, once in the hip and once in the heart. He died almost instantly. As George Gardstein left the house he was tackled by Constable Walter Choat who grabbed him by the wrist and fought him for possession of his gun. Gardstein pulled the trigger repeatedly and the bullets entered his left leg. Choat, who was a big, muscular man, 6 feet 4 inches tall, managed to hold onto Gardstein. Other members of the gang rushed to his Gardstein's assistance and turned their guns on Choat and he was shot five more times. One of these bullets hit Gardstein in the back. The men pulled Choat from Gardstein and carried him from the scene of the crime. Yakov Peters, Yourka Dubof, Peter Piaktow and Fritz Svaars, half dragged and half carried Gardstein along Cutler Street. Isaac Levy, a tobacconist, nearly collided with them. Peters and Dubof lifted their guns and pointed them at Levy's face and so he let them pass. For the next half-hour they were able to drag the badly wounded man through the East End back streets to 59 Grove Street. Max Smoller and Nina Vassilleva, went to a doctor who they thought might help. He refused and threatened to tell the police. They eventually persuaded Dr. John Scanlon, to treat Gardstein. He discovered that Gardstein had a bullet lodged in the front of the chest. Scanlon asked Gardstein what had happened. He claimed that he had been shot by accident by a friend. However, he refused to be taken to hospital and so Scanlon, after giving him some medicine to deaden the pain and receiving his fee of ten shillings, he left, promising to return later. Despite being nursed by Sara Trassjonsky, Gardstein died later that night. The following day Dr. Scanlon told the police about treating Gardstein for gun-shot wounds. Detective Inspector Frederick Wensley and Detective Sergeant Benjamin Leeson arrived to find Trassjonsky burning documents. Soon afterwards, a Daily Chronicle journalist arrived: "The room itself is about ten feet by nine, and about seven feet high. A gaudy paper decorates the walls and two or three cheap theatrical prints are pinned up. A narrow iron bedstead painted green, with a peculiarly shaped head and foot faces the door. On the bedstead was a torn and dirty woollen mattress, a quantity of blood-stained clothing, a blood-stained pillow and several towels also saturated with blood. Under the window stood a string sewing machine, and a rickety table, covered with a piece of mole cloth, occupied the centre of the room. On it stood a cup and plate, a broken glass, a knife and fork, and a couple of bottles and a medicine bottle. Strangely contrasting with the dirt and squalor, a painted wooden sword lay on the table, and another, to which was attached a belt of silver paper, lay on a broken desk supported on a stool. On the mantelpiece and on a cheap whatnot stood tawdry ornaments. In an open cupboard beside the fireplace were a few more pieces of crockery, a tin or two, and a small piece of bread. A mean and torn blind and a strip of curtain protected the window, and a roll of surgeon's lint on the desk. The floor was bare and dirty, and, like the fireplace, littered with burnt matches and cigarette ends - altogether a dismal and wretched place to which the wounded desperado had been carried to die." Another journalist described the dead man "as handsome as Adonis - a very beautiful corpse." 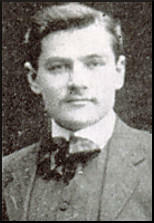 In an attempt to find out more about George Gardstein the police issued a photograph of him taken after his death. George Gardstein after his death. Bentley stepped further into the room. As he did so the back door was flung open and a man, mistakenly identified as Gardstein, walked rapidly into the room. He was holding a pistol which he fired as he advanced with the barrel pointing towards the unarmed Bentley. As he opened fire so did the man on the stairs. The shot fired from the stairs went through the rim of Bentley's helmet, across his face and out through the shutter behind him. 'Gardstein' by now had closed to within three or four feet and was firing just across the table. At point-blank range he could not miss. His first shot hit Bentley in the shoulder and the second went through his neck almost severing his spinal cord. Bentley staggered back against the half-open door and collapsed backwards over the doorstep so that he was lying half in and half out of the house. 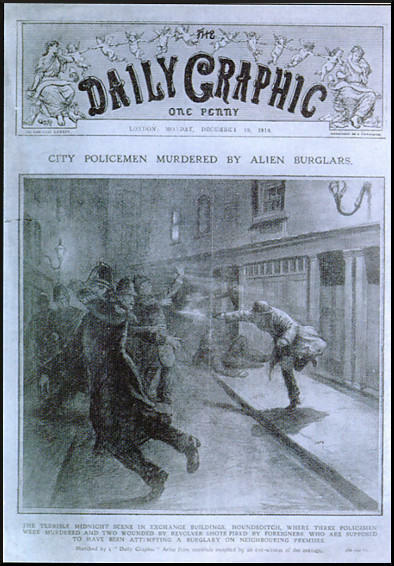 Bryant, who had been standing partly behind him, glimpsed the pistol turning towards him and put out his hands instinctively, as he said later, "to ward off the flashes". He felt his left hand fall to his side and then, stumbling over the dying Bentley, he fell into the street. He had only a hazy recollection of what followed but he remembered getting up and staggering along the pavement. Fortunately he walked away from the entrance to the cul-de-sac, which probably saved his life. He was very dazed and fell down again. He regained consciousness some minutes later and found himself propped up against the wall of one of the houses. He had been shot in the arm and slightly wounded in the chest. Constable Woodhams saw Bentley fall backwards over the doorstep and ran to help him. He could not see who was doing the shooting. Suddenly his leg buckled beneath him as a Mauser bullet shattered his thigh bone and he fell unconscious to the ground. Constable Strongman and Sergeant Tucker saw him fall but neither could see who was doing the shooting. Only a hand clutching a pistol protruded from the doorway. 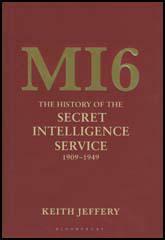 "The hand was followed by a man aged about 30, height 5 ft 6 or 7, pale thin face, dark curly hair and dark moustache, dress dark jacket suit, no hat, who pointed the revolver in the direction of Sergeant Tucker and myself, firing rapidly. P. S. Tucker and I stepped back a few yards, when the sergeant staggered and turned round.' Strongman caught him by the arm and Tucker staggered the length of the cul-de-sac before collapsing in the roadway. He had been shot twice, once in the hip and once in the heart. He died almost instantly. grip on Gardstein, who was seized by two of the group and dragged away. But already he was a dying man. All around I see awful things which I cannot tell you. I do not blame our friends as they are doing all that is possible, but things are not getting better. The life of the workman is full of pain and suffering, but if the suffering reaches a certain degree one wonders whether it would not be better to follow the example of Rainis (an author of Lettish poems) who says burn at once so that you may not suffer long, but one feels that one cannot do it although it seems very advisable. The outlook is always the same, awful outlook for which we must sacrifice our strength. There is not and cannot be another outlet. Under such circumstances, our better feelings are at war with those who live upon our labour. The weakest part of our organisation is that we cannot do sufficient for our friends who are falling. For instance, such an incident occurred last week. I had to send 10 roubles to Milan Prison for S. German who is to be transferred to another prison. I also had to secure the necessary for Krustmadi, and this evening I received news from Libau prison that one of our friends of last summer has been taken there without any money. We ought to help but we have only 33 kopecks and the treasury of the Red X is quite empty. It is terrible because the prisoner may think we will not help him!